LOS ANGELES – Matt Kemp beat the Diamondbacks for the second straight game, hitting a two-run double in the ninth inning that lifted the Los Angeles Dodgers over Arizona 3-2 Sunday for sole possession of first place in the NL West. A day after Kemp launched a go-ahead, three-run homer in the eighth against Archie Bradley, the Dodgers’ slugger tagged him again. Kemp’s one-out drive off the wall in left-center field put Los Angeles alone atop the West for the first time since Aug. 7. The Dodgers beat the Diamondbacks by identical 3-2 scores three days in a row, after Arizona won the series opener at Dodger Stadium. Brad Boxberger (2-5) started the ninth and put the potential tying and go-ahead runs on with consecutive walks to pinch-hitter Alex Verdugo and Max Muncy. The runners advanced on Enrique Hernandez’s sacrifice bunt and set up Kemp. Daniel Descalso homered leading off the ninth against Caleb Ferguson to put Arizona ahead 2-1. 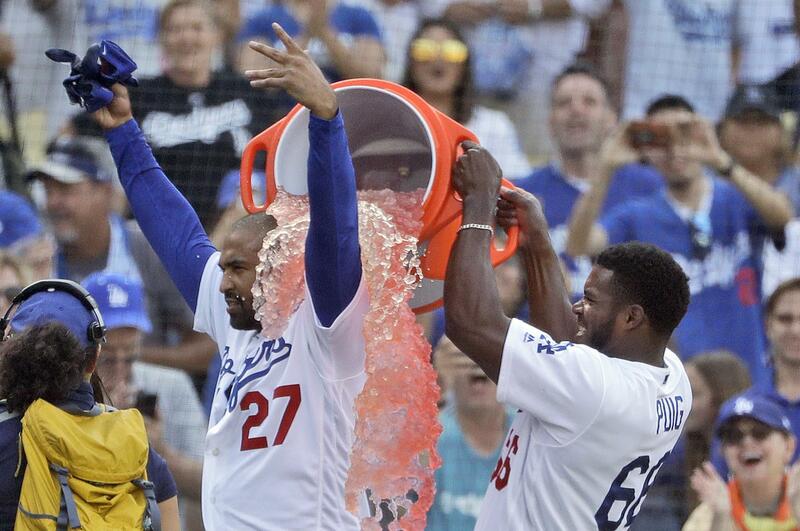 Kenley Jansen (1-5) got the last three outs. HOUSTON – George Springer hit a two-run homer and finished a triple shy of the cycle to lead Houston past Los Angeles in Shohei Ohtani’s return to the mound for the Angels. Ohtani (4-2) lasted just 2 1/3 innings in his first time pitching since June 6 because of an elbow strain. Both of the hits he allowed were to Springer – a leadoff single and his two-run shot in the third that made it 2-0. Ohtani joined Babe Ruth as the only players in major league history to start 10 games as a pitcher and hit 10 homers in a single season. The rookie, who has 15 homers, missed almost a month after he was injured before returning as the team’s designated hitter on July 3. Houston starter Gerrit Cole (13-5) allowed six hits and two runs in 5 2/3 innings for his third straight win after losing three in a row. He struck out nine to move past teammate Justin Verlander (240) and into first place in the American League with 243 strikeouts. Roberto Osuna pitched a perfect ninth for his 12th save. ATLANTA – Ronald Acuna Jr. hit his seventh leadoff homer of the season and scored the tiebreaking run in a four-run eighth inning to help NL East-leading Atlanta beat Pittsburgh. The 20-year-old Acuna singled off Steven Brault (5-3) to begin the eighth, advanced on a bunt and scored from second on a headfirst slide after second baseman Kevin Newman errantly let Freddie Freeman’s hard grounder bounce between his legs and roll into shallow right field. Acuna’s first-inning shot was his 23rd overall and tied the franchise record for leadoff homers that Marquis Grissom set in 1996. Jonny Venters (4-1) got the last out of the Pirates’ eighth to earn a win in relief for the second straight game. CLEVELAND – Rookie Brandon Lowe homered and drove in three runs to lead Tampa Bay. Ryan Yarbrough, another rookie, allowed one run in five-plus innings of relief for opener Diego Castillo, who was removed after Yandy Diaz’s leadoff single in the second. Yarbrough (13-5), who earned his major league-leading 11th relief win, was pulled after Jose Ramirez’s RBI single in the seventh. Adam Kolarek pitched two scoreless innings before Cleveland made it closer in the ninth. The Rays have won 11 of 13 and are a season-high 10 games over .500 (73-63). Tampa Bay trails Oakland by eight games for the second wild card spot in the AL. Francisco Lindor singled off Hunter Wood to lead off the ninth. Jose Ramirez drew a one-out walk and Diaz had an RBI single. Jose Alvarado replaced Wood and struck out Yonder Alonso, but Melky Cabrera’s two-run double cut the lead to two. ST. LOUIS – Eugenio Suarez’s two-run homer off of Bud Norris in the 10th inning lifted Cincinnati past St. Louis. After Suarez’s 31st of the season, Brandon Dixon hit a solo homer four pitches later as the Reds hit back-to-back homers for the fifth time this season, the sixth and seventh home runs given up by Norris (3-4). They came right after Michael Lorenzen (2-1) pitched out a bases loaded, nobody out jam in the ninth without giving up a run to send the game to extra innings. Raisel Iglesias earned his 25th save in 29 chances despite allowing a run for the fourth time in his last five outings. The Reds won for just the third time in their last 11 games, including the last two against the Cardinals, snapping their series winning streak at 10. St. Louis (76-61) fell a half game behind the Milwaukee Brewers into the second wild card spot in the National League. OAKLAND, Calif. – Stephen Piscotty homered twice and drove in five runs as Oakland widened its lead over Seattle for the second AL wild-card spot. The A’s moved 5 1/2 games ahead of Seattle for the final AL wild-card slot. Edwin Jackson (5-3) allowed one run and three hits in six innings. He improved to 5-0 with a 1.30 ERA in five career starts against the Mariners. Athletics reliever Fernando Rodney surrendered Ryon Healy’s two-out RBI single in the eighth. Blake Treinen recorded four outs for his 35th save. Seattle starter Felix Hernandez (8-13) is 0-7 over nine outings since beating the Royals on June 30. SAN DIEGO – Chris Iannetta hit a go-ahead, two-run double in the seventh inning and Colorado salvaged a split of the four-game series to stay within a half-game of the NL West lead. The Rockies came into the series one-half game behind Arizona before losing the first two games. They snapped San Diego’s four-game winning streak on Saturday night and then beat rookie Jacob Nix (2-3) on Sunday. Arizona and the Los Angeles Dodgers were tied for the division lead going into Sunday’s finale of their four-game series at Dodger Stadium. Kyle Freeland (13-7) got the win, allowing three runs and seven hits in six innings. He struck out three and walked two. SAN FRANCISCO – Noah Syndergaard pitched a two-hitter for his first career complete game, striking out 11 as New York beat San Francisco. Syndergaard (10-3) made his 81st start in the majors and topped the Giants for the second time in 12 days. He matched his season high for strikeouts, walked one and retired 20 of the final 22 batters. Syndergaard continued a strong stretch by New York’s rotation. Over the past 15 games, Mets starters have a 1.61 ERA. Michael Conforto hit his 20th home run, Jeff McNeil had two hits and two RBIs and Todd Frazier added a pair of hits. The Mets won for the seventh time in their last eight games at AT&T Park. The Giants have lost three of four. Limited to a total of two runs in the first two games of the series, the Mets matched that in the second. Frazier led off with a single and Conforto homered off Chris Stratton (9-8). ARLINGTON, Texas – Yohander Mendez earned his first major league win and Nomar Mazara hit two of Texas’ six homers. Mendez (1-1) allowed three hits and one walk while striking out two in six scoreless innings. He was making his second major league start in a season when he was a combined 2-10 with the Rangers’ top three farm teams. Mazara hit a two-run homer in a nine-run sixth inning and a solo homer in a five-run eighth as the Rangers pounded 12 extra-base hits, tying a team record set in 1986. Twenty-three-year-old Gabriel Moya, 11 days older than Venezuelan countryman Mendez, made his first major league start after compiling a 3-0 record in 24 relief outings. Moya gave up a two-run homer to Elvis Andrus in the first. Zack Littell took over in the second and pitched into the sixth, when Robinson Chirinos homered to key the big inning. CHICAGO – James Shields threw six scoreless innings, Tim Anderson and Daniel Palka homered and Chicago beat major league-leading Boston. The Red Sox have the majors’ best record at 94-44 and maintained a 7 1/2 -game lead in the AL East over the New York Yankees, who lost to Detroit. Shields (6-15) struck out six and allowed four hits and two walks. PHILADELPHIA – Javier Baez hit one of three solo home runs off Cy Young candidate Aaron Nola to reach 30 home runs and 100 RBIs, and Jon Lester pitched six shutout innings to continue his mastery of the Phillies and help lead NL Central-leading Chicago. Daniel Murphy and Anthony Rizzo also went deep off Nola (15-4), who gave up three home runs in a game for just the second time over 88 starts in his four-year career. Chicago, which has won 10 of 12, began play leading the Cardinals by 4 1/2 games. The Phillies fell 3 1/2 games back of Atlanta, which hosted Pittsburgh Sunday night. NEW YORK – Rookie Victor Reyes hit his first major league home run, doubled twice and singled, leading Detroit over New York. The Tigers split the four-game series. The Yankees began the day 7 1/2 games behind Boston in the AL East and finished 3-4 on their homestand against Detroit and the Chicago White Sox, both far below-.500 teams. Yankees manager Aaron Boone was absent while serving a one-game suspension for nicking plate umpire Nic Lentz with his cap during an animated argument Friday night. Bench coach Josh Bard filled in for Boone. Reyes drove in three runs with his career-high four hits. Yankees starter Lance Lynn (9-9) allowed six runs and nine hits with one walk while striking out six over 3 2/3 innings. Matthew Boyd (9-12) gave up three runs and five hits with one walk while striking out six over six innings. KANSAS CITY, Mo. – Jorge Lopez showed some of the potential the Royals saw when they traded for him in late July, scattering five hits over a career-best seven innings and helping Kansas City rout Baltimore. The Royals completed a three-game sweep of the only team in the majors with a worse record than theirs. The only run Lopez (1-4) allowed came in the first, when Jonathan Villar sent a mistake over the left-field wall. Lopez bounced back to strike out a career-high eight without a walk to earn his second win and first since Sept. 29, 2015, when he was still with the Brewers. Orioles starter David Hess (3-9) allowed five runs and nine hits, and was victimized by a trio of Baltimore errors – all of which came after his own mistakes during a dreadful third inning. WASHINGTON – Christian Yelich hit his first career grand slam, Keon Broxton added a three-run homer, and Milwaukee beat Washington. Both Broxton and Yelich homered as part of a seven-run fifth inning. It matched Milwaukee’s highest-scoring inning of the season. Washington starter Jefry Rodriguez (2-2) struggled with his control throughout his outing, walking seven while allowing seven runs in 4 2/3 innings. But he wasn’t hit hard until the fifth. Manager Dave Martinez pulled Rodriguez after another single and a walk, but reliever Tim Collins fared no better. Reliever Brandon Woodruff (3-0) pitched four scoreless innings to earn the victory. MIAMI – Sean Reid-Foley struck out 10 over seven innings and earned his first major league win to lead Toronto. Teoscar Hernandez hit a three-run homer and Luke Maile had three doubles for the Blue Jays. Reid-Foley (1-2) allowed one run and four hits with one walk in his third major league start. The 23-year-old righty struck out the side in the first inning and worked himself out of a no-out, bases-loaded jam in the fifth with just one run scoring. Thomas Pannone pitched the final two innings for Toronto. Miami starter Jeff Brigham (0-1) made his major league debut, pitching three innings and giving up three runs on four hits and four walks. Published: Sept. 2, 2018, 9:55 p.m.